Yet between the desire and the action, to paraphrase T.S. Eliot, lies the shadow. It is quite daunting to consider how to actually train for a marathon. Many are confronted by problems such as how to train, how to keep their minds from getting bored during the long runs, how to avoid injuries and how to develop the necessary endurance. To these very questions, I have developed the following points to help aspiring runners meet their goals. This list is not just the advice of someone who enjoys running. This is the advice of someone who has completed 6 marathons to date and has successfully used these techniques. Pick a training plan that is geared towards your current fitness level and your time goal for the marathon. You can find many sensible plans in Runner’s World or Running Times. Track your runs using an app such as RunKeeper or with a GPS enabled watch from Garmin, Nike or Adidas. You need a tool like this to make sure you are progressing at a sensible rate. Give yourself a break after every 20-30 minutes where you drink and walk for one minute. Then continue. Make sure you have a good sports drink. 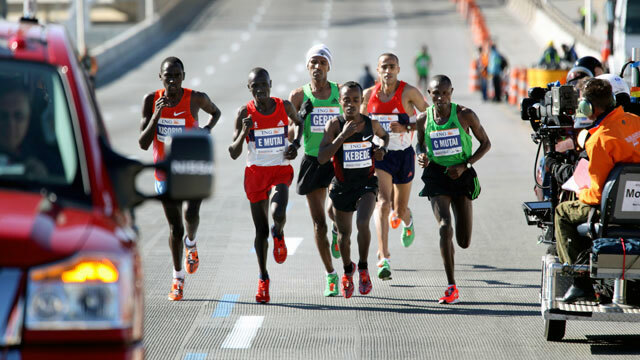 Check out which sports drink will be used at your marathon so that you are prepared. Don’t drink anything new on marathon day. Also, have a sports bar or gel or Gu. These come in particularly after 13 miles or so. Find out what works for you rather than simply adhering to what others say has worked for them. Try to run with your iPod and have some really motivational music on that makes you feel like moving. Get some really cool running gear. You'll feel amazing and it will motivate you. Find a running group. There are lots of groups that are training now and having company is really helpful on long runs. You don't train for a marathon by only running long distances. No matter what your time goals, you need to include cross training so as to avoid excessive pounding on your body. Chip Gosewisch incorporates Arc Training into his ultra-marathon training regimen. Still not sure where to sign up for your marathon? Go to Running In the USA to see all the races in your area. One piece of advice that’s integral for all runners, though, is to be sure to have fun. Go out there and start training. You’ll do great.